Facing an era of innovation, dentistry should also be deeply involved in realizing and sustaining the “health and longevity of society”. It is the role of dentistry to also show its endeavors to support the “medical treatment giving the ability and the energy for life” which is directly linked to the enhancement of quality of life (QOL) to the public. 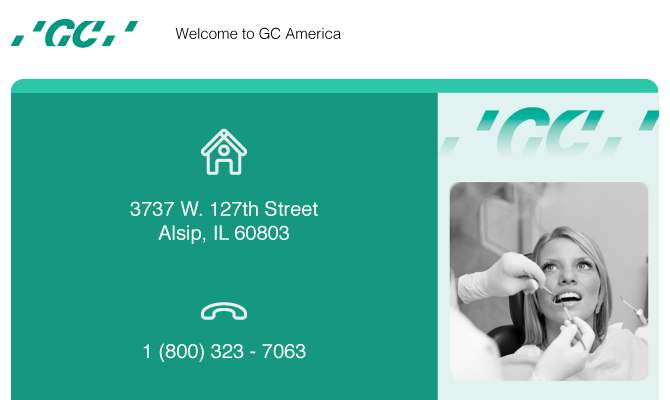 In response to these trends, GC America Inc. advocates what it calls “GC’s Quality Management” (GQM) and under this slogan, each member of the GCA Team attempts to fully satisfy and deeply impress customers by striving to provide valuable products, information, and services in their own field. Our aim is to continually strive to realize “the century of health” and become “the top dental corporation of the world”, making major contributions in the 21st century as a global yet distinctive dental care company.